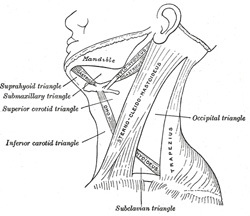 Anterior Triangle.—The anterior triangle is bounded, in front, by the middle line of the neck; behind, by the anterior margin of the Sternocleidomastoideus; its base, directed upward, is formed by the lower border of the body of the mandible, and a line extending from the angle of the mandible to the mastoid process; its apex is below, at the sternum. This space is subdivided into four smaller triangles by the Digastricus above, and the superior belly of the Omohyoideus below. These smaller triangles are named the inferior carotid, the superior carotid, the submaxillary, and the suprahyoid.